Powerful dailies systems target high-end productions with added support for Sony F65, 4K Dailies, High Frame Rate Cinematography and Background Processing. Filmmakers today need precise representation of what’s been captured in order to push the limits of the movie going experience. Creative Science high-end mobile dailies systems make this possible. Creative Science a Los Angeles based post-production rental and technology company, today announced upgrades to their fleet of mobile dailies systems for support of realtime 4K dailies workflows, 48 or 60 frame per second Cinematography, and background rendering of deliverables. Integrating the first dailies software to provide 4K playback for Sony’s F65 RAW and other high-resolution digital cinema cameras, Colorfront On-Set Dailies software and Creative Science mobile systems open up a host of new creative possibilities for filmmakers and studios. When capturing images using Sony F65RAW, RED Epic 5K or Alexa ARRIRAW and intended for 4K mastering and exhibition, productions will now be able to view and manipulate their raw files in realtime 4K while applying dailies LUTs and color grades, sync sound, and other image processing functions. With this new technology, critical details such as focus and lens attributes can be judged accurately utilizing 4K digital projectors and monitors allowing for the highest quality and precision. Mobile systems from Creative Science also support the new capability of Colorfront On-Set Dailies to utilize a single workstation for rendering dailies deliverables in the background while working on newly received footage in the foreground. This ability effectively halves the time required to process footage and produce deliverables. Creative Science’s latest generation of high-performance Dailies systems are now available for rental and can be custom configured to fit the unique needs of any given scenario. The company remains committed to offering emerging technology to studios and filmmakers wherever their creativity may take them. Creative Science is a post-production rental and technology company focused on mobile solutions and leading technology tools for major studios, production companies and post-production providers. Founded in 2010 by industry veterans Mike Doggett, Merle Sharp and Marco Bario, Creative Science’s mission is to push the limits of remotely deployed post-production through providing rental systems, training, software, and consultation to top entertainment industry companies. 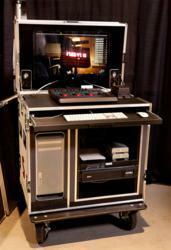 Creative Science is a North American Authorized Rental, Training and Integration partner of Colorfront On-Set Dailies. For more information visit creativescience.com.